Easter is the principal festival of the Christian Church. It marks the Resurrection of Jesus Christ on the third day after his Crucifixion. This holy day never comes before the 22nd of March or after the 25th of April. In another words, it is celebrated on the first Sunday after the full moon on or after March 21. There is a long period of preparation called Lent before Easter. 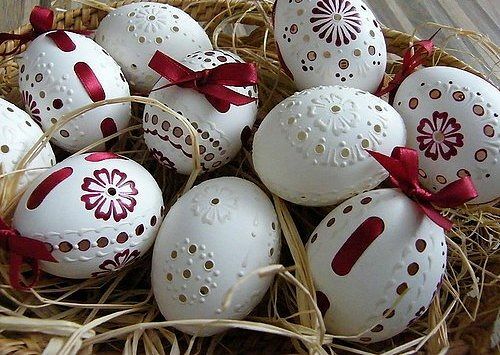 Easter begins with the Easter matins and high mass during which traditional Easter breads (pasky or kulichy) and decorated Easter eggs (krashanky) are blessed in the church. The red Easter egg is the symbol of Resurrection and the life beyond the grave. Butter, lard, cheese, sausage, smoked meat, salt, pepper, and horseradish are also blessed. After the matins all church-goers exchange Easter greetings “Christ is risen!” “Indeed He is risen!” People give each other Easter eggs and then hurry home with their baskets of blessed food. Very often people go to the cemetery to commemorate the dead and put Easter eggs on the graves. In Britain, for example, at Easter children eat chocolate Easter eggs. Sometimes parents hide them in the house or in the garden and the children look for them. The name “Easter” is pagan in source. “Eostre” was the name of a goddess whose festival was celebrated in spring. While other European nations use the Jewish name for the feast of the Passover, the English prefer to use the word “Easter”. Passover is an eight-day festival in spring celebrating the Jews’ escape from slavery in ancient Egypt. You may use some ideas that will help you to make an ordinary Easter Egg Hunt unforgettable! 1. Make colourful invitations to the hunt in the shape of rabbits and ducks. 2. You will need some 12 — 15 plastic eggs per person filled with small toys, coins, candies, jelly beans, beads, key chains. 3. Decorate nearby tables and stock them with juice, water and snacks for hungry hunters. 4. Set up the playing area and hide eggs. For the younger children leave eggs on open places and low branches. 5. Start the game off with a wistle, and let the hunt begin! Prepare a first-aid kit for any unforseen accidents. Prepare some extra baskets for those who do not bring their own. Little kids can choke on such treats as small toys and jelly beans. This video is published with the kind permission of the author Lada Bedriy (Parson) who now lives in Connecticut, a state in the northeastern US, on the coast of the Atlantic Ocean (population — 3,501,252; capital — Hartford). If you like this article, share it with your friends on the social networks, please. Эта запись написана автором Елена Шрамкова, 01.05.2015 в 01:12, и размещена в категории Топики. Следите за ответами на эту запись с помощью RSS 2.0. Вы можете написать комментарий или разместить обратную ссылку на своем сайте.